相簿列表 » Frogs of Madagascar. The Malagasy Rainbow Frog (Scaphiophryne gottlebei) is one of the most famous and rare amphibian among Malagasy frog species. In 2008, the Zoological Society of London was named the Malagasy Rainbow Frog as "being among the rarest and most remarkable amphibians" on the planet. 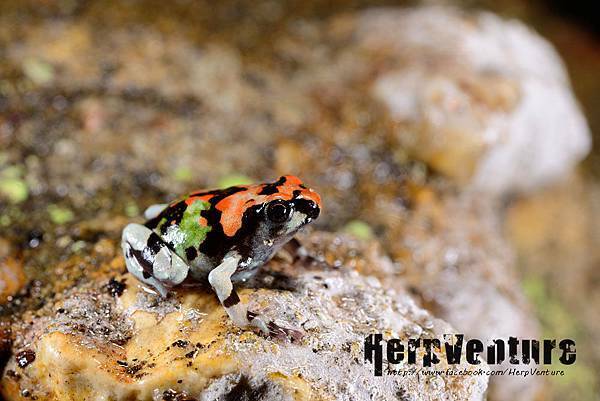 The beauty of Malagasy Rainbow Frog is being proved. But the population's main threat has coming behind the beauty; thousands are captured every year for the pet trade, it makes them caught in a vicious cycle. The Malagasy Rainbow Frog inhibit in the rocky canyons of the Isalo Massif, south western Madagascar. They occured and bred only in the temporary pools of the canyons and only in raining season. It's difficult to find during dry season, so we can only found 6 juveniles in about 90 minutes. They were pretty tiny, only about 10 mm for SVL (the adult are about 30-40 mm) each, but still, it's AWESOME! It's enough for me! Hope we can always find them again and again every time we visit there!